Endometriosis affects 1.5 million women in the UK and causes the tissue from the lining of the womb to grow outside of the uterus. The endometrium is the inner lining of the uterus that thickens throughout the menstrual cycle in preparation for implantation of a fertilised egg. For those with endometriosis, this lining grows outside of the uterus, most commonly in the ovaries and around the fallopian tubes. Laura Roberts was diagnosed with severe endometriosis in 2008. Endometriosis can affect fertility and after unsuccessfully trying to conceive Laura and her husband Damion were referred for NHS fertility treatment at Bourn Hall Clinic Cambridge. After meeting with Dr Thomas Mathews, UK Medical Director at Bourn Hall, Laura began treatment. Dr Mathews says: “Endometriosis can reduce fertility but the cause is not fully understood. One of the treatments that is often recommended is to drain or ablate the cysts. These dark brown or ‘chocolate’ cysts, as they are called, form because the blood produced during menstruation is unable to escape. Laura underwent egg collection in July 2011 and five of these eggs successfully fertilised, however only one embryo was sufficiently developed to be transferred into Laura’s womb. Unfortunately, a week and a half after implantation Laura experienced a heavy bleed. Laura took a pregnancy test a week later which showed a faint positive result. Once again, the couple were advised to wait before repeating the test. 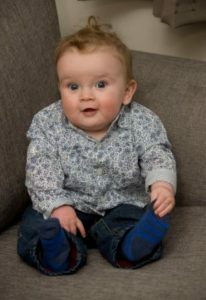 Barney was born happy and healthy by Caesarean section on the 29th March 2012. One of the common symptoms of endometriosis is severe period pains, something which many women learn to ‘accept’ or ‘just get on with’. Endometriosis UK wants to encourage more women and teenagers to break the taboo and talk about their periods, so this condition can be diagnosed and treated sooner. Find out more about NHS funded treatment at Bourn Hall here.